Greeley Grindhouse will play Tuesday, September 17th. So mark your calendar, you won’t want to miss “Reptilicus“. The fun begins at 7:20 p.m. The original version, produced in Danish and directed by Danish director Poul Bang, was released in Denmark on February 25, 1961. 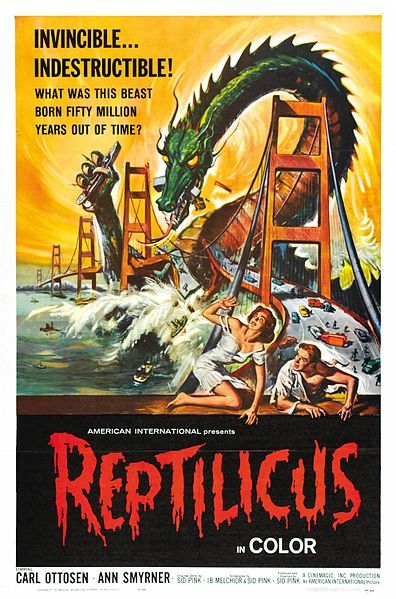 Reptilicus, brings to life a giant monster film about a fictional prehistoric reptile produced by American International Pictures and Saga Studios. Upon closer speculation it seems that it’s two distinctly different films produced by two different directors. The story line goes a little something like this. Danish miners dig up a section of a giant reptile’s tail from the frozen grounds in Lapland, where they are drilling. The section is flown to a Danish Aquarium in Copenhagen where they preserve the tail in a cold room for scientific study. But, due to mishandling, the room is left open and the tail begins to thaw. Imagine the scientist’s amazement when they returned to find that it’s beginning the regeneration process. Professor Martens, the man in charge of the Aquarium, dubs the reptilian species “Reptilicus”, and compares its regeneration abilities to that of other animals like earthworms and starfish. Once the tail section completes regeneration, Reptilicus goes on a rampage from the Danish countryside to the panic-stricken streets of Copenhagen. You’ll have to watch the rest of the movie to see what happens! The American producer-director, Sidney W. Pink,directed the American version, with an almost identical cast to the original. This version was initially deemed virtually awful and the American International Pictures would not release it. It required extensive rework by the film’s Danish-American screenwriter, Ib Melchior, before finally releasing it in America in 1962. Mac Bell will once again host this great evening and encourage the heckling on Smack TV. Grab your appetizers and beverages and get prepared for an evening of fun. This entry was posted in Entertainment and tagged & grill, free movie, Greeley Grindhouse, Mac Bell, portland oregon things to do, reptilicus, sports bar & grill by greeleyave. Bookmark the permalink.